It was moved by Miss Robertson that we try to raise $50 to take out a contributing membership in the America Library Association. The same matter was to be taken up at a meeting of the Library Board the first Friday in March. 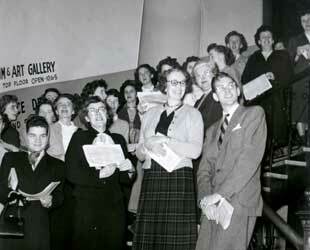 – the first minutes of the Vancouver Public Library Staff Association. 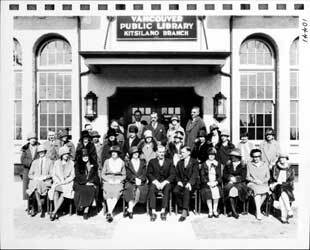 Staff in front of the first Kits Branch at 2375 West 4th Avenue, 1928c. 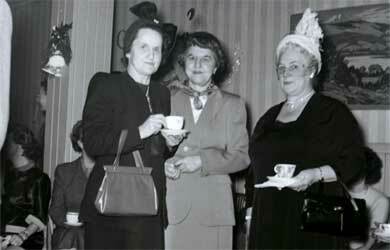 The Association met in the tea room regularly to establish a constitution, to examine implementing a medical service plan, to create a staff bulletin, as well as to form a Red Cross committee to support others. Miss Margaret Black, on behalf of Vancouver Public Library Staff Association, submitted an application to the Joint Council of Public Employees, British Columbia Division in the spring of 1944. The joint council accepted the application and the staff of VPL officially joined the labour movement on November 16, 1944. One of the first battles the incorporated group took on was preventing the confiscation and destruction of all “Nazi publications”. unaccessioned photo that was a gift from Gil Jaegell. 1950s? Vancouver Public Library, Special Collections. NUPE merged with NUPSE (Public Service) in September of 1963 to form the Canadian Union of Public Employees (CUPE). Our local number remained 391 as we became members of the country’s largest union on September 23, 1963. In 2002, the staff of Gibsons and District Public Library signed their first collective agreement and officially joined CUPE Local 391. The incorporation of a sub-local was a first for the organization. CUPE 391 remains true to the original roots of the labour movement and the goals set out by the VPL staff association. We follow our constitution, work at securing improvements in working conditions and employee benefits, communicate with the membership, assist those in need and fight injustices. Local 391 is the largest library union in British Columbia and proud to be a member of CUPE. an unaccessioned photo that was a gift from Gil Jaegell.